LAS VEGAS – Billionaire Sheldon Adelson took in his first high school basketball game of the season Thursday night, sitting courtside in a gray suit and purple tie at the Adelson Educational Campus. The casino magnate smiled, clapped and delivered high-fives outside the locker room after watching Adelson School — which he helped found in 2008 — cruise by Beatty 70-36 in a Division IV Southern League game. 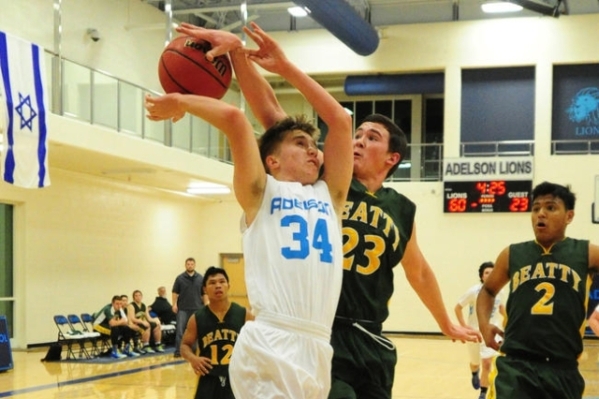 Jalen Pitts and Jake Buchman scored 13 points apiece to pace Adelson School (5-5 overall, 3-0 Division IV Southern), which got scoring contributions from 12 players, including four points from Matan Adelson, the son of Sheldon. The Lions, who have made three consecutive playoff appearances, appear to be headed for a fourth after dismantling the overmatched Hornets (4-3, 2-1). Adelson School used its stingy full-court pressure to create 13 turnovers in the first quarter and take a 24-11 lead. The Lions forced a total of 28 turnovers. Adelson School shot 29 of 52 (55.8 percent) from the field, frequently making easy layups in transition and converting short jumpers inside the 3-point line. Miles Hagen scored eight of his 10 points in the first quarter and Jacob Elharrar added nine steals and five assists for the Lions, who led 37-13 at halftime and 57-19 with 40 seconds left in the third quarter. Jacob Oseguera had 15 points, all in the second half, for Beatty. Lindzey Gross scored eight for the Hornets, who were 13-for-43 (30.2 percent) from the field. The Hornets travel to Round Mountain (9-6, 2-1) on Thursday. The Knights’ only league loss came on Saturday, losing to Spring Mountain 68-44. Beatty played Round Mountain at a tourney and lost to them 64-44 so this Thursday should be a tough game for them. The Adelson family recently acquired the Pahrump Valley Times through their purchase of the Las Vegas Review-Journal.